19XX: The War Against Destiny is a vertical scrolling shooter arcade game released by Capcom in 1996. The story takes place before a fictional war (“19XX”) as a lone pilot tries to defeat an entire army/evil organization from starting another World War, which soon escalates to a nuclear apocalypse. The player selects one of three different planes, each with different ratings in speed, power, and the strength of their homing attack. When flying through the levels, three primary weapons can be used by picking up their respective items, to fire either spreading vulcan bullets, straight-firing lasers, or multi-directional missiles. 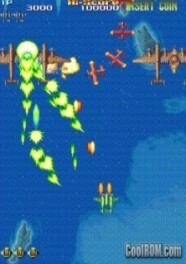 By holding button 1, the player can charge up to fire a special missile. If this missile hits a large enemy, the player will lock on to that enemy, and can fire fast homing projectiles to damage it further. There is also a supply of smart bombs which can be used to clear away the majority of enemies and their projectiles from the screen. Smart bombs can also be charged up, and each level of charge yields a different effect. If the player is shot down while charging up a bomb, the bomb does not go off. At the end of every level, the player receives additional points for the number of bombs you have in stock, a rank increase of 1-5 for the percentage of enemies destroyed, a grade for the time it took to defeat the boss, and a bonus for every medal collected which is multiplied by the rank. After beating the last level, the player also gets a large bonus for the number of lives he has remaining. Each plane has a different set of statistics and a special weapon, the latter determining which weapon can be powered-up beyond other weapons. There are 3 weapons available in the game. These are found by destroying a red formation of enemy planes or a red Flying Pancake that appears in later levels. Vulcan – Straightforward shots. The level 1 version of this gun is default on all ships from the start (and whenever you lose a life). The P-38’s specialty; produces 3 shots when fully powered-up. Missiles – 3 way missiles. More powerful than the Vulcan or Laser at close range. The Mosquito’s specialty; when fully powered-up, the forward firing missiles become stronger. Laser – Large blue laser. The Laser has the “piercing effect” (can go through standing, destroyable structures) and is somewhat stronger than the Vulcan. The Sinden’s specialty; when fully powered-up, produces twin laser beams instead of one.